Tannehill Park hosted the Alabama Forge Council conference on September 11-13. 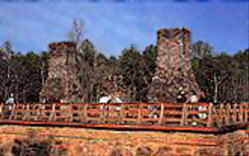 This early ironworks operated up until it was burned during the Civil War by Gen. James Wilson (a direct ancestor of our Jim "Paw Paw" Wilson who now lives in the South and sends his regards with a mischievous grin). More about sign on page 19 The Alabama Forge Council is a very active group consisting of 12 forge groups located throughout the state, from North Sand Mountain, near the Tennessee line to Bayou Forge at the Gulf of Mexico. 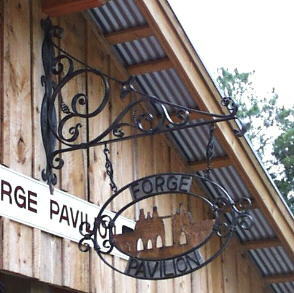 Pavilion sign (left) at Tannehill was forged and assembled by members during several workshops. The Tannehill Furnace scene is embossed copper and the lettering is on brushed stainless for contrast. This required doubling the number of letters and attaching them to separate matching backs. Would you like your group's event covered in the anvilfire News?